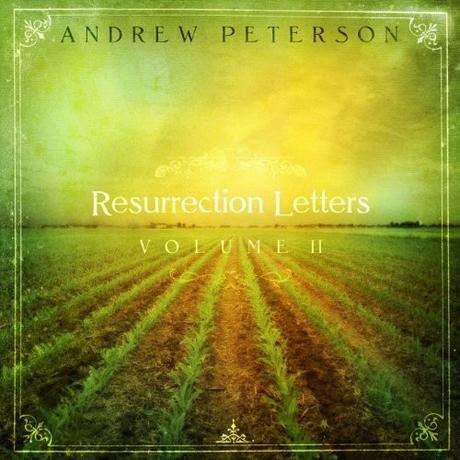 Dove Award-nominated recording artist, songwriter, filmmaker and award-winning author Andrew Peterson released his long-awaited album, Resurrection Letters, Vol. I, March 30 and EP, Resurrection Letters: Prologue, Feb. 9 from Centricity Music, both amidst 5-star acclaim. The most congregational songs that Peterson has ever offered, the recordings are available now as digital-only releases at iTunes, Apple Music, Amazon Music, Spotify, Google Play and more while a physical-only Deluxe Edition combining the music of both projects is at favorite retailers everywhere. Peterson’s Resurrection Letters: Prologue is a collection of five “waiting songs” meant to remind listeners of the gravity of the crucifixion while Resurrection Letters, Vol. I begins with the heartbeat of the resurrected Christ, exploring the resurrection itself and its centrality to Christianity. Vol. I features songs like “I’ve seen Too Much,” “His Heart Beats” and “Is He Worthy?” The latter song became the first video from the album that was premiered by The Gospel Coalition and called “a moving meditation on the coming kingdom of heaven” by RELEVANT Magazine. The video has already been viewed nearly 750,000 times on Andrew’s Facebook and YouTube pages. Produced by Ben Shive, Resurrection Letters, Vol. I is the prequel (think Star Wars) to the highly acclaimed album Peterson released and Shive produced in 2008, Resurrection Letters, Vol. II, which is more about the implications of Christ’s resurrection victory over sin and death in our own lives. Ten years in the making, the celebratory new Vol. I is meant to move listeners to a greater gratitude, awe and love for God. The Gospel Coalition echoes that Vol. I is “one of his best” and provides readers with “A Guide to the Music for Andrew Peterson” while SiriusXM’s “The Message” offered a “Resurrection Letters Holy Week Special” with Peterson leading into Easter and highlighting his Resurrection Letters three-album project. World Radio’s “Listening In” further features Peterson while the World News Group sponsors a Homeschool Convention event with him Friday, April 13 at the Duke Energy Convention Center in Cincinnati, OH. Peterson’s Resurrection Letters Tour continues the following day (4/14) in Detroit (Brighton, MI), where a second event was added due to the first one selling out. Leading fan favorites and music from his Resurrection Letters trilogy, Peterson’s tour also travels this month to Bethel, CT (4/21), Greenville, SC (4/27), Jamestown, NC (4/28) and Columbia, SC (4/29). For more information about Peterson, including his upcoming tour dates, visit www.andrew-peterson.com, www.facebook.com/andrewpetersonmusic or www.Twitter.com/AndrewPeterson. About Andrew Peterson: Recording artist, songwriter, producer, filmmaker, publisher and award-winning author of The Wingfeather Saga series, Andrew Peterson is also host of the popular creative community known as The Rabbit Room (www.RabbitRoom.com) and recently launched a film and TV production company, Shining Isle Productions, to produce the animated film based on his bestselling books. Peterson’s studio album, The Burning Edge of Dawn (2015), debuted at No. 2 on the Billboard Current Contemporary Christian Top Albums Chart becoming his highest charting record to date. Known for songs like “Dancing In The Minefields,” “Be Kind To Yourself,” “The Reckoning,” “Don’t You Want To Thank Someone,” “The Silence Of God,” “Nothing To Say,” “You’ll Find Your Way” and more, Peterson has also been named “one of the foremost singer/songwriters around” and has received multiple “best album of the year” nods from critics along with two Dove Award nominations. Taking his hits and fan favorites on the road, Peterson’s touring draws capacity crowds at venues around the world, including several sold-out events at the historic Ryman Auditorium in Nashville. About Centricity Music: Centricity is an independent Christian music company based in Franklin, Tenn. Founded in 2005 with a commitment to artist development and stylistic diversity, its artist roster includes Aaron Shust, Andrew Peterson, Caitie Hurst, Carrollton, For All Seasons, Jason Gray, JJ Weeks Band, Jonny Diaz, Jordan Feliz, Lauren Daigle, Neon Feather, North Point InsideOut, Peabod and Unspoken. Providing label and publishing services, Centricity is a family-owned organization, and they like it that way. The committed work of its staff and artists has yielded successes such as Grammy nominations, Billboard Awards, Dove Awards, K-Love Fan Awards, a Gold Album and Gold Singles. For more information on Centricity Music, visit www.centricitymusic.com. What’s Happening with My Race Training and Running?